Our Joy knows no bounds with enthusiasm Our Joys know no bounds with enthusiasm when it's time for Lord Mahaganapati to arrive and bless us. The fast ensuing Ganeshotsav is our 64th and our 5-day celebrations will begin from Thursday the 13th of September 2018 and continue until Monday the 17th of September 2018. We are indebted to our Revered Swamiji, H. H. Shrimad Sudhindra Tirtha Swamiji, with whose blessings and guidance we have been able to perform this luminous Ganeshotsav. Our guiding light now is the present Mathadhipati of Sri Kashi Math Samsthan, H. H. Shrimad Samyamindra Tirtha Swamiji from whom we have sought blessings, and Prayers are also offered at the Ubhaya Vrindavans atWalkeshwarSri Kashi Math. 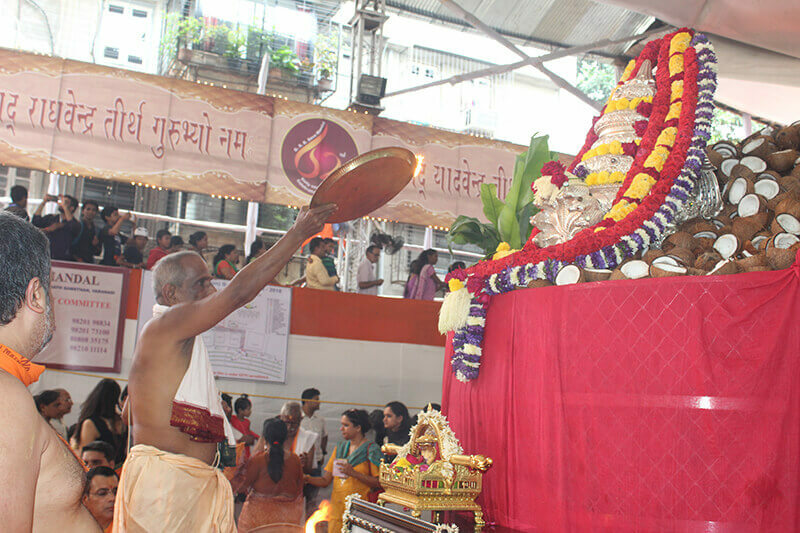 We wish to inform you that during the last Ganeshotsav celebrations over 66,000 poojas were performed by devotees which included, nearly 8,000 Tulabhars that are usually offered by devotees on fulfillment of their prayers. Your contribution has helped us carry forward our various socio-religious activities, viz. Freeship, Medical Assistance, Marriage Assistance, Samuhik Upanayan, Adhyatmik Shibir, Career Guidance Camp, etc. You are one of our devotees who have been always paying a visit and performing poojas. You are aware of the traditional & Sacred environment in which the festival is organized& hence we feel assured that you would come forward this year too to offer your seva in a much more enhanced manner. To facilitate our donors, we also have our website www.gsbsevamandal.org for on line booking of Sevas and poojas. We feel assured that this year too Lord Mahaganapati will bless us all and inspire us to perform His seva in a pomp and befitting manner. We look forward for your wholehearted support and active participation, in the form of Tana-Mana-Dhana. Donations to the trust for education and assistance related activities are exempt under sec 80 G of the income tax act. Income Tax Exemption extended as per clauses contained in Certificate under Section 80-G is I.T. (E) / M.C./80-G/2737 /2007 /2008-09. Note : G S B Seva Mandal has all the rights to use contact details of sevadars for religious purposes. *Visarjan procession starts at 17.30 hrs Route : R.A. Kidwai Road, Maheshwari Udyan, Dr. Ambedkar Road, Dadar T.T., Tilak Bridge, Sena Bhavan, Gokhale Road, Sayani Road to Manda l's Office, Veer Savarkar Marg, Worli Naka, Haji Ali, Tardeo, Nana Chowk to Girgaon Chowpatty. VIRAT DARSHAN ON TUESDAY, 11TH SEPTEMBER, 2018 AT 8.00 p.m. N.B. : Celebration Committee/ Managing Committee reserves the right to make any changes in the above programme without giving any notice. Patil Boir Apt, 3rd Fir, Nr Municipal Office, Dombivili (El -421 201. 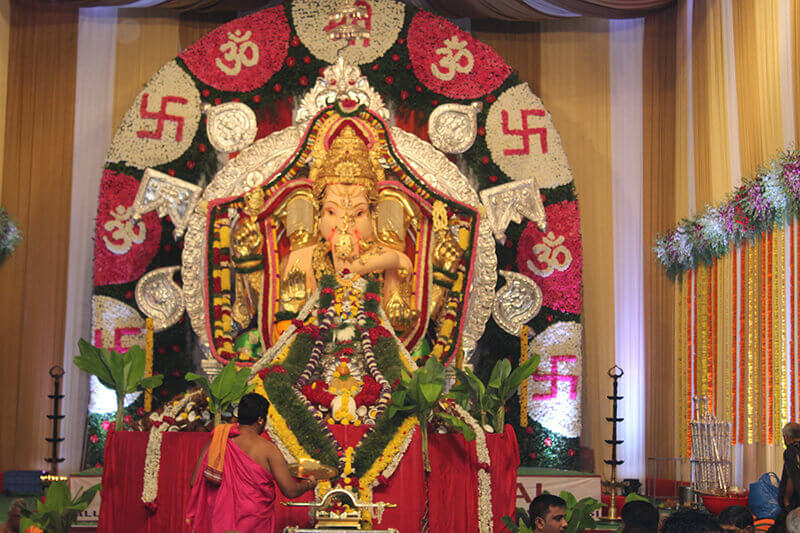 Ganeshotsav Venue, Sukriteendra Nagar, Near S.N.D.T. Womens College, R.A.K.Rd., King's Circle, Mumbai - 400 019. Shri Ashok Pai, 301, Cosmos Avenue, Gokhale Road, Station Road, Besides Shiv Sagar Restaurant, Thane (W) 400 601. • Token will be issued from 7.00 to 9.00 a.m. on first 4 days and upto 8.30 a.m. on the 5"' day for performing Ganahoma Seva. Those who wish to participate should bring a Dhoti & Shawl. • No Prasad will be given after Visarjana Pooja on the 5th day. • Due to security reasons, offering of Coconuts, Prasad, Sweets, Flowers, etc. brought from outside, are not allowed in the "Sukriteendra Nagar". • Sukriteendra Nagar main gate will be closed from 11.00 p.m. to 5.00 a.m. Mukha-Darshan from the Sky-walk will be allowed throughout. Patil Boir Apt, 3rd Fir, Nr Municipal Office, Dombivili (E) - 421 201.